This week the Church calendar begins Ordinary Time, which simply means the celebrations are not of any special events. Our message series “Walking in the Light” continues as we look at the readings from this weekend. We are called to be lights in the world and we are looking at different ways in which we are the light of Christ. Two weeks ago we celebrated the feast known as the Epiphany. A celebration of Three Wise Kings following the light of Jesus to his crib, in a stable in Bethlehem. Their presence acknowledging his Kingship, a welcome to the new King they bring royal gifts. We read many places in the gospels about light, Jesus saying, “I have come as light into the world, that whoever believes in me may not remain in darkness” (John 12:46) We are called to be light and to let our light shine. Our message focused on knowing the light has come and challenged us to be ready to walk in the light. Walking in the light does not mean we just let our good work show. Walking in the light let’s all we do show, though we are not perfect. When we fail as disciples we have a God who is mercy and gives strength to our vulnerabilities. Walking in the light requires we actually walk in a new way of life. Last week we were challenged again to walk in the light and let all we do show. We read how Jesus at his baptism hears the voice of the Father proclaiming, “You are my beloved Son; with you I am well pleased.” This is a message God speaks to each of us as we do the work of spreading his Word and living according to his teaching. We looked at how we are the beloved of God. As the beloved of God we should be willing to walk in the Light. Nothing can attract people more to God than seeing our belovedness shine in the Light. When walking in the Light we are joining in fellowship with one another and with Jesus as the light that leads us all. This week we see Jesus beginning his public ministry and in particular the story of the Wedding at Cana where we hear the words, “Do whatever he tells you.” This is a great mantra for all followers of Jesus, it is advice that will lead to a life of peace and joy. It is being obedient in God, which is our message this week. We have freedom to choose, we are free to choose good over bad, love over hate, generosity of selfishness, serving others over self-pleasure and devotion to Christ over promotion of self. Choosing to follow the path of Christ is the obedient choice and one that leads to a life of abundance. As we continue in our series theme; “Walk in the Light” we are challenged to live obedient in God. 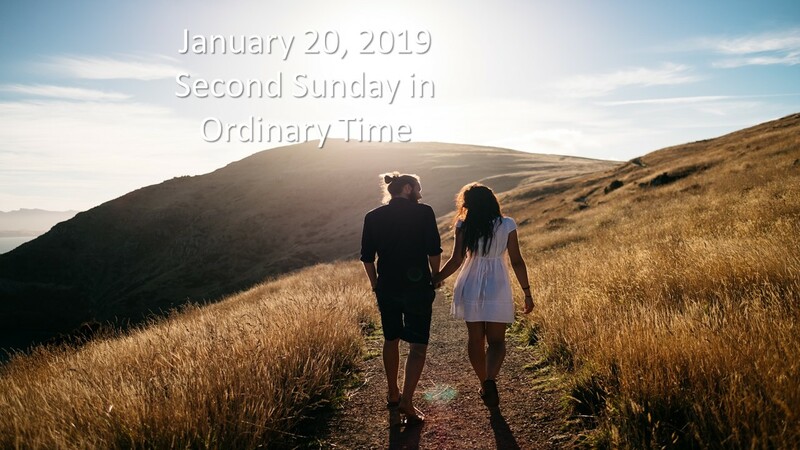 The readings this week are from the Lectionary for the Second Sunday in Ordinary Time; Isaiah 62:1-5; Psalms 96:1-2, 2-3,7-8, 9-10; 1 Corinthians 12:4-11 and John 2:1-11. This week we see God bestowing a new name on Jerusalem and claiming he will not rest until his purpose for Jerusalem is fulfilled. We are called to use our gifts to proclaim the kingdom, to have our gifts shine in the light for the purpose of God. We also see Jesus’ first miracle, making wine from water, through those who were serving who did exactly as he told them. We have a message of obedience to God bringing a New Jerusalem, which we are called to help grow with our gifts and our trust in God’s authority. This is how we can walk in the light building God’s kingdom and attracting others to the mission of Jesus. The first reading from Isaiah is God speaking about the future of Jerusalem, ultimately indicating as a bridegroom stands ready for his bride, God will come down from heaven and dwell on earth to become one with the church though his incarnation. The reading speaks of the vindication and salvation of Jerusalem. Then he goes on to speak of the beauty of Jerusalem, she will receive a new name, no longer known as forsaken or desolate (Israel often was an unfaithful “wife” that God never divorced, but at times she was forsaken and desolate.) But with her new name, “My delight” the Lord takes Israel as his bride. As a bride marries she receives a new name, and Jerusalem will get a new name when reconciled to God. God sees the relationship with the people as two becoming one, each living for the other. It is realized when Jesus became flesh and walked among us, dying for our sake. This particular message of obedience has multiple dependencies, God must marry Israel, Israel must obey and love God and Jesus must dwell among us. If this chain of obedience is not honored by all, then the plan falls apart. In the second reading from First Corinthians Paul speaks of gifts. These are given to be used as service to the community. They are in place to help build up the community. The gifts are attributed to the Spirit, Lord and God, depending on the type of gift. But regardless of the gift or the provider of the gift we are asked to use our gift to help build the Kingdom of God. Gifts are available so that we may be inspirational in our dealing with others. God knew we would need special gifts to build up the church and so has endowed many of us with these gifts; of faith, healing, mighty deeds, prophecy, discerning spirits, speaking in tongues and interpretation of tongues. All these gifts can be used in one way or another to bring people to the church and build up the faith of those in the church. Even though we are gifted, it is up to us to use our gift for right purpose. This is where our obedience in God is needed, if we have a gift but don’t use it, which is our choice, we are not practicing obedience. If we have been given a gift, we should obey and use our gift for good, letting those who see us, see us use our gift, letting our light shine. In the gospel reading from John we read the story of the wedding at Cana. Jesus, his disciples and his mother are at a wedding when they run out of wine. Miraculously, Jesus turns water in to wine. This gospel is significant in that it is Jesus first miracle in the Gospel of John, which his disciples see and are amazed. It includes prompting from his mother, so we see Jesus listens to the requests of the faithful, and it has the servants doing what Jesus tells them to do (two examples of obedience.) In this story everyone has a role and they obey within their role creating the miracle. The power of this message is in the words, “Do whatever he tells you to do.” These words are spoken about Jesus and they shouldn’t remain just in this story. These are a small prayer we can pray often so when our time comes to obey we will have trained ourselves for our yes, our willing obedience to the plan of God. In time we will need to obey and we will need to walk in the light of the Lord so God can lead us in obedience. We will let others see and come to God though our obedience. We have seen in these readings there is a theme of obedience, while we are free to choose, choosing God’s journey will not only be a safe and secure path, but it will be the happiest path we could ever take. Doing God’s will makes us partners in the creation of the Kingdom, and creates a better world. We should always be willing to try. The word obedient seems to have become a word with a negative connotation. Maybe it came from how wedding vows were recited, to obey one another, or more perhaps coming from the scripture verse from Paul where he says wives obey your husbands. But in biblical language this obedience in marriage is meant in the context of love. If a husband truly loves his wife, the way Christ loves the church, the way the Father loves the Son than, obedience should be very safe, and in fact it becomes joy. But, there have been abusive situations where a wife might have been hurt and thus the word obey got a black eye. But, there are so many places where obedience is necessary. Children must obey their parents. If a child just does what they want and doesn’t have to obey there is a very good chance they will be badly hurt or even die. Additionally without obeying their parents they will not learn. So for children in a healthy home who obey they are helped, not hurt. But at a certain age we don’t want to obey anymore. Jesus certainly obeyed. We hear many times in scripture Jesus says he has come to do the will of the Father. Jesus says, he does nothing on his own but only does the will of the Father. Noah obeyed and built an Ark and was saved from the flood. Abraham obeyed and took his Son Isaac for sacrifice and God rejoiced in his faith, called him righteous and made him the father of many. We have many places in life where we must obey for success. Anyone in the military knows that obeying their officers is a must or people could die. In any organization there is a hierarchical structure that must be obeyed in order to support the success of the company. In an emergency situation we all obey the instructions of the police or firefighters. When we hear warnings about foods causing sickness or death from the Center for Decease Control we obey because if we don’t we would be putting ourselves in danger. We even obey things; when the bell rings at the end of a flight, we all stand up and grab our luggage and try to leave. When the bells rings in school at the end of a class we all get up and leave the classroom. A fire alarm causes us to get up and leave and head to safety. There also seems to be models of obedience that look inverted, for example when a baby cries in the middle of the night, a mother gets up and serves the baby’s need. When a patient pushes the bell in a hospital the nurse comes to give them aid. So we have many models of obedience that we naturally follow and obey which usually have positive effects on our life, our growth and our safety. This model of obedience tells us there is always some authority in our life that we should obey. And while we might think following this authority would seem to be giving up our freedom, we can quickly see following authority is truly helpful, helping to grow, helping to be safe and secure, and helping to teach us. In the story of the Wedding of Cana, following the authority of Jesus becomes a miraculous moment. By doing as their told the servants are instruments of creating the better wine. It is a small miracle that serves to keep the bride and groom from being embarrassed, and allowing their wedding to continue as hoped. But, what those closest to Jesus see is that he can perform signs and will perform many over their journey together. It reveals Jesus’ glory, which means those who witnessed this miracle realized that God is in their presence. To obey someone means we trust them. We don’t obey who we do not know. But it also means there is trust from the one being obeyed. It is a mutual trust. To obey in a biblical way is to hear God’s word and act accordingly. To be obedient to God means to hear, trust, submit and surrender to God in his Word. This of course means we have to know God. We have to know God’s Word. We have to develop and grow in our relationship with God. Then we discover that we not only trust God, but that we love God and we want to do God’s will. This was the core action of Jesus, to do the will of the one who sent him. Jesus knew God and God knew Jesus and they trusted one another. Jesus was so trusted that he could speak for God. This kind of relationship comes with authority. We are challenged to walk in the light. We are called to be obedient to God and to reveal our obedience to all who see us. Through our obedience we are doing the will of God and imitating Jesus. To arrive at this obedience we have deepened our relationship with God, we have come to know the Word of God, we have accepted and used our gifts for God and we have become the delight of God. When we are obedient we live in the light, and we accept that light shining on us and glorifying God by what we do. This is how Jesus lived and it is how we are being called to live as well. As disciples we are always required to live in such a way that others see us and want to glorify God. It is not easy and it requires service, putting others first and walking in the light. But what can be easy is doing the will of God, being obedient, listening to the one who has created us and tells us in a special way I need you, my Word can only go out through you. It is a great trust for God to say he needs us. God does trust us enough, depends on us enough to let us know we are needed. We are encouraged to reveal to others their beauty. Through our love for God we can extend a voice of encouragement to others. Trusting God we can share love so others will be encouraged to find God and walk in the light.